Welcome to our CSA page. No CSA shares are currently available. ​Become a share holder and receive nutritious and delicious locally grown produce each week. We also offer fresh, beautiful flowers to brighten your days. Community Supported Agriculture (CSA) is a partnership between a farmer and the local community. This approach to farming allows members to purchase a "share" of crops that are produced at a farm. Members pay for their share during the time of year when the farmer is spending money on seeds, equipment and supplies needed to produce what we all enjoy eating. The farmer commits to making every effort to supply top quality produce, with minimal hours between harvest and your pick up. 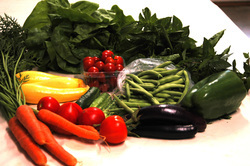 Members receive prime produce grown specifically for them. As a CSA member, you join a community that supports the local economy and your local farmer. As a member, you are not required to work on the farm growing or picking what you receive. Each week you simply pick up your "share" of fresh and healthy produce that is high in vitamins and hasn’t traveled for days – or weeks – to reach your table; take it home, and enjoy! What Does a Produce Share Include? A share includes a bin of fresh-picked produce grown using sustainable farming practices and no chemical herbicides or pesticides. We grow a wide variety of vegetables and flowers. We focus on growing reliable standbys such as lettuce, tomatoes, cucumbers, squash, beans, peppers, eggplant, peas, basil, sage, mint and parsley, but also include some less common produce for you to try. Receive a bouquet every other week or choose any 7 weeks to receive your flowers. Pick-up day at the farm in Boylston is Tuesday from 1:00 to 7:00 p.m. Please contact us if this time / location does not work for you. If you are unable to pick up your share any week, you may arrange for someone else to pick it up for you. Please notify us of this change. Shares not picked up will be donated to a food bank or community service agency of our choice. The exact start date each year is weather-dependent but is usually in early June. Sorry, no Shares are Currently Available. Download the application form to the left, fill it out and mail it to us with your check. Payment in full with your application is appreciated. Because we understand the challenge of including the cost of a season of produce or flowers in one payment, we do offer a payment plan. The cost of your share may be divided in half (see application for due dates). Shares are also available on a 4-week basis, beginning any week of the month. . . Contact us for more information. You are welcome to split your share with someone else. We ask that one person act as the primary contact person. The number of shares is limited, and they are allocated on a first-come, first-served basis. Please be aware that your share is not secured until we receive a payment. Don’t be disappointed – secure your share today! Feel free to contact us with any questions by clicking on the "Contact Us" tab above, emailing us directly at Woodlandridgefarm@hotmail.com or by phone at (508) 736-0684. Please leave a message if we are unable to pick up the phone, and we will get back to you as soon as possible. We appreciate your support and look forward to your joining us this year for another fruitful growing season!